Modernity took many forms in 1930s Japan, but in the tumultuous years before militarism pushed the country toward global aggression, it was most visibly associated with a glittering consumer culture. Inundated with western jazz-age trends and new technologies, Japan's big cities, especially Tokyo, offered the most enticing attractions to a newly liberated generation: bustling streets of department stores, cafes and teahouses, movie theaters and ballroom dance halls. Modern architecture, industrial design and fashion overshadowed traditional arts as Japan strove to take its place in a cosmopolitan world. "The Brittle Years "examines the different ways in which designers and artists visualized what it meant to be modern in Japan in the years leading up to World War II. Its 160 full-color illustrations of paintings, textiles and graphic arts are astonishing not only for their great visual impact but also for the insight they provide into a rapidly transforming nation. 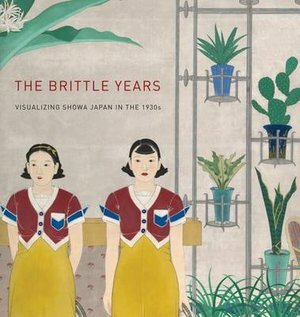 Among the more surprising images are kimonos bearing patterns of tanks or futuristic cityscapes, paintings of fashionable Japanese women with bobbed hair in western dress and handbills of factory and agricultural workers joined in solidarity. Essays by leading experts on Japanese art and history, including the Pulitzer Prize-winning author John W. Dower, elucidate the many tensions within Japanese society and show how and why such images of power, progress, and beauty helped the nation celebrate and divert modernity to new purposes during these brittle years.